Hands-down, this is my absolute favorite recipe for homemade brownies. They are chewy, moist, soft, and delicious! Alrighty guys, I’ve sort of made a mistake. I don’t use the phrase “the best” lightly when it comes to food, so when I named these brownies, “The Best Brownies” I meant it. And then I tried this new version of brownies and it became the new, “Best Brownies” recipe. I wish I could describe to you how utterly delicious these triple chocolate chewy brownies are, but I can’t. So I’m leaving it up to you to get into your kitchen right now, and make a batch because everybody who tries them will likely love you forever. And that’s pretty awesome. The key to these brownies is three different types of chocolate including dutch processed cocoa powder, unsweetened chocolate, and semisweet chocolate. The dutch processed cocoa powder definitely makes a difference, so I recommend taking the time to find it. Some grocery stores don’t sell it, like the one I frequent, but I was able to find some at Penzey’s Spices. If you’re wondering what the difference is between the two types of cocoa powder, check this out. Another element about this recipe that I just love is that there are mini chocolate chips all throughout the batter. After you bake the brownies, there are little pockets of ooey gooey chocolate! Aside from the three types of chocolate, the other key, I’ve found, to making wonderful brownies is to undercook them a bit, then let them cool completely. The cooling process takes a couple hours, but it’s needed when you don’t cook them entirely. 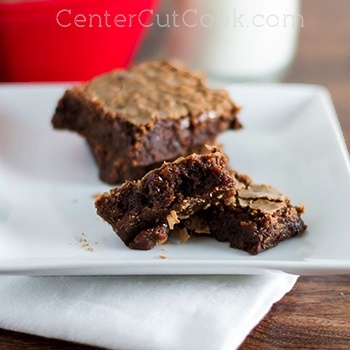 While this recipe is definitely more “fussy” than boxed brownies, it’s worth every second! Pre-heat your oven to 350 degrees and adjust the baking rack to the bottom. Line a 9 x 13 inch pan with foil to create a sling for the brownie batter. This will make it easier to remove the brownies from the pan. Just place a piece of foil in one direction, then place a piece of foil going the opposite direction. Allow the foil to hang over the sides. Spray the foil with non-stick cooking spray. In a large bowl, combine the boiling water and the cocoa powder. Use a whisk to stir until the cocoa powder is dissolved. Add in the unsweetened chocolate, and whisk until all of the chocolate is melted. Next, stir in oil, and melted butter. Stir in sugar, then add flour, and salt. Stir until all ingredients are combined. Fold in mini semi-sweet chocolate chips. Use a spatula to scrape the batter into the pan lined with foil. Bake on the bottom rack for 30 to 35 minutes. Insert a toothpick to check for doneness, you want some moist crumbles to be on the toothpick which means they are cooked just right. If the toothpick comes out clean, you’ve overcooked the brownies. Remove the brownies from the oven and transfer the pan to a wire rack and cool for about 90 minutes. Then, use the foil overhang to lift the brownies out of the pan. Allow the brownies to continue to cool for an additional 60 minutes. You can speed the process along by placing the brownies in the refrigerator for about 30 minutes. Cut the brownies into squares and serve.